If you love cinnamon rolls, and you love blueberries, you NEED TO MAKE THIS RECIPE! Homemade cinnamon rolls are my love language. If someone tells me they’re making cinnamon rolls for brunch, and I show up expecting homemade cinnamon rolls and am greeted with their sad canned counterpart… I have to admit I’m a little disappointed. Not that people need to make good food (read: homemade cinnamon rolls) to be my friend exactly, but just that soft, fluffy sweet rolls are absolutely fabulous… and the canned kind are just a little blah. I know people are scared of baking with yeast, but it’s totally doable–and this recipe is a great place to start! For these blueberry sweet rolls, I use the same dough as my Copycat Cinnabon Cinnamon Rolls… and that dough is SO forgiving. I’ve screwed it up more times than I can count. I’ve mismeasured the yeast, added too much flour, forgotten the buttermilk… I could go on. Basically, it takes a lot to mess up that dough, and even if you do, chances are good that your sweet rolls will still bake up soft and tender. And still be easy to roll out. #winning And for the record, if you invite me over, ask ME to make the cinnamon rolls. I’ll be happy to oblige! I could eat regular cinnamon rolls year round, but in the summer, I want to add fruit to everything! I mean, I eat copious amounts of fruit every day… so it’s only natural. Peaches! Watermelon! Berries of all types! This time, I loaded up on the blueberries because why not? The sweet blueberry filling I made is good enough to eat with a spoon, but please save some for your sweet rolls. You’ll probably have extra so you can swirl it in your oatmeal, top your ice cream with it, or just enjoy it as is. I added some cinnamon to the blueberry filling because it seemed only natural, but there’s also some cardamom in there to make it extra special. The best part about the blueberry filling is that some of it pools on the bottom of the baking dish as the rolls rise and bake. Yum!! After the rolls are baked up and before you dive in, take a minute to make a super easy cream cheese frosting. I added a bit of lemon juice and lemon zest, and that citrus addition was perfection! I prefer cream cheese frosting on my cinnamon rolls, blueberry or otherwise, but if you want something a little lighter, you could just make a glaze with powdered sugar, cream/milk, and lemon juice. There are recipes online but you could improvise with a cup of powdered sugar, a tablespoon of cream/milk, and a tablespoon of lemon juice and go from there. I highly recommend the cream cheese frosting but if you want something simpler, that glaze would also be fantastic. Oh, and while this post is 100% NOT sponsored, if you’re in Nashville… be sure to check out Mr. Blueberry for the delivery service of your blueberry dreams. 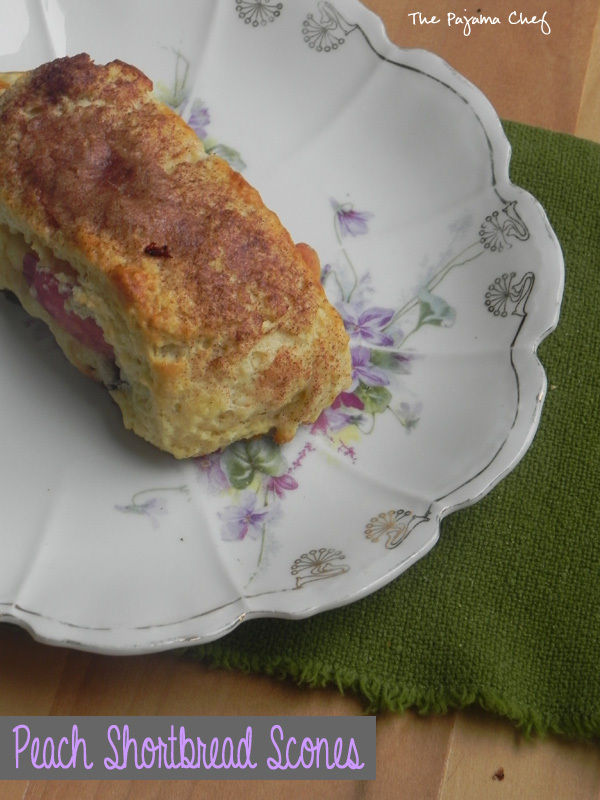 I used their luscious Michigan blueberries to make these sweet rolls (and to devour!). The season is almost ending (I think the last delivery is next weekend, August 24-25, 2018). Just FYI, friends! 🙂 Have a great Wednesday!! When dough is almost ready, prepare filling. In a medium saucepan set over medium-high heat, stir together blueberries, brown sugar, cinnamon, and cardamom. Bring to a boil, then reduce heat to low. Cook for 4-5 minutes, stirring occasionally. In a small bowl, whisk together lemon juice and cornstarch, then pour into blueberry mixture. Cook for another minute or two until mixture begins to thicken. Remove from heat and stir in vanilla. Allow to cool. Mixture will thicken a little more as it cools. Grease a 9×13 inch baking pan and set aside. When dough is ready, flour your clean counter top/work surface. Punch down the dough and roll into a large rectangle, about 20×30 inches. Spread butter over dough, leaving a 1 inch margin on all edges. Next, top with the blueberry filling mixture. You probably won’t use all of it, and if your filling is very runny, you will want to use a slotted spoon to remove excess liquid. I overfilled the rolls so I would recommend starting with 1/3 cup of the filling and adding more from there. Extra filling is great on ice cream or oatmeal, or by the spoonful! Roll into a tight log, rolling from the long side closest to you. When you are almost to the other end, bring the far long side up and over so the seam is on top. Gently press the exposed edge to the top of the dough to seal. While rolls bake, prepare frosting. Using a stand mixer, hand mixer, or a whisk, beat together cream cheese and butter until smooth. Add vanilla, lemon juice, and lemon zest, beating until combined. Add powdered sugar gradually, mixing until smooth. In my stand mixer this usually takes about 2-3 minutes. When I make the rolls the night before, I leave the butter and cream cheese on the counter overnight so they are soft in the morning. Brighten up your Valentine’s Day celebration with this refreshing Grapefruit-Walnut Sheet Cake! It’s even frosted too! Winter is made for citrus, is it not? Or citrus is made for winter… no matter how you put it, citrus brings warmth and energy to otherwise dull, cold, dreary days. I know a lot of people associate citrus flavors–lemon, lime, orange, grapefruit–with summer [lemonade sure helps there!] but I’ve always been in the winter=citrus camp. In junior high and high school, we sold citrus fruits in the winter to raise money for orchestra [yup, I was an orch-dork! #Violin #ThenViola]. And, how many classic books talk about children reaching into their stockings on Christmas and being THRILLED to receive an orange? Yup. Winter=citrus. So it was only fitting that my snow day baking last week involved this refreshing Grapefruit-Walnut Sheet Cake. This cake reminds me, a little bit, of a classic lemon cake… tangy and sweet all at once, but remixed with the unique floral notes of a grapefruit so you know it’s something special! Since grapefruits have a certain degree of tartness to them, you definitely need the sugar and cinnamon in this recipe to balance out the flavors. This cake uses all of the grapefruit–zest AND juice–to make the grapefruit flavor really stand out. KitchenIQ is one of our fabulous sponsors, and generously sent the bloggers involved in this event a Strawberry Tool [can’t wait to find some good looking strawberries to test out this strawberry slicer!!] and a wonderful Better Zester! This zester was wonderfully easy to use and was so sharp that it hardly took any effort to zest a whole grapefruit. Love it! Thanks for your support in #FreshTastyValentines, KitchenIQ! You can find Kitchen IQ on Facebook, Twitter, and Pinterest… and be sure to enter the giveaway by February 8, 2016 for a chance to win some of their great products. 🙂 I hope you win so you can make this festive grapefruit-walnut snack cake! The grapefruit cream cheese frosting is NOT to be missed. Enjoy! Preheat oven to 375 degrees F. Grease a 9×13 inch pan with cooking spray and set aside. Begin by zesting and juicing the grapefruit. You’ll need 3 tablespoons zest [this was about 3/4 of the grapefruit zested for me] and 10 tablespoons of juice [the whole grapefruit–I was actually a wee bit short so I added about a teaspoon or two of water and zested the whole grapefruit to make up for it]. Cool completely before frosting, at least 1 hour. When ready to frost, beat cream cheese and butter with an electric mixer for 1-2 minutes until creamy. Add vanilla, 1 tablespoon zest, and 2 tablespoons juice and beat for 30 seconds to blend. Gradually add powdered sugar until desired consistency is reached, beating on low until blended. Frost cooled cake and enjoy! Store covered in the refrigerator. Disclosure: I received a complimentary Better Zester! and Strawberry Tool from Kitchen IQ for my participation in #FreshTastyValentines. However, I was not required to write a positive review and I was not otherwise compensated for this post. The thoughts expressed above are entirely my own. Thanks to KitchenIQ for their sponsorship of this event! 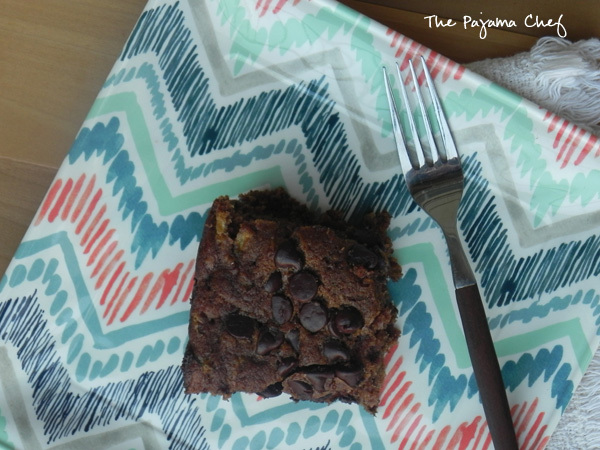 This is the BEST zucchini cake I have ever had! And it doesn’t even have frosting. Crazyyy! I never had zucchini anything until I met Ben. He opened up a whole world to me! Zucchini muffins, bread, cookies, pasta, cake… well, I guess he opened up basically a whole new world of sweets [with the addition of some veggies so you can pretend to be a little healthier]. HA! The first summer after we were married, we were served zucchini cake for dessert by some of our new church friends. 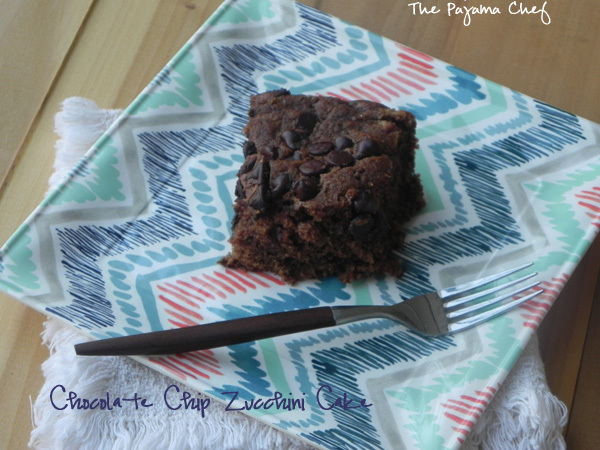 This chocolate zucchini cake was amazing… and had the best, thickest chocolate frosting ever. It was positively scrumptious! Problem was… every time I made zucchini cake after having hers, I wanted layer upon layer of chocolate frosting. But sometimes that’s too much work. Or you don’t want to wait for the cake to cool completely before that. Or you want to be able to eat the cake for breakfast. Or ___ [insert other “problem” here]. SIGH. But guess what guys?!? Once I discovered THIS cake, my problems were solved. Hallelujah! 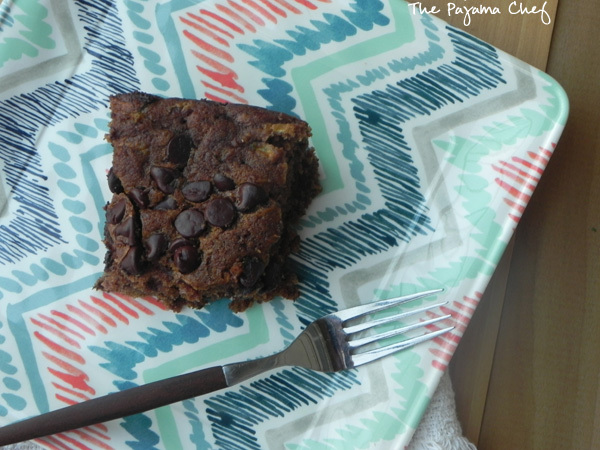 one year ago: Dark Chocolate Chunk Peanut Butter Blondies – with vegan and gluten free options! Preheat oven to 350 degrees. Grease a 9×13 inch pan with cooking spray and set aside. In a medium-sized bowl, whisk together the flour, cocoa powder, baking soda, baking powder, cinnamon, and cloves. In the bowl of a stand mixer, cream together the butter and sugar. Beat in the oil, eggs and vanilla. Add the flour mixture to the creamed mixture alternately with the buttermilk. Stir in the zucchini. Pour into prepared pan. Sprinkle with chocolate chips. Bake for 45-50 minutes or until a toothpick inserted in the center comes out clean. Cool on a wire rack. Enjoy! This is also great with ice cream. Yes, I know that says Peach Shortbread Scones. They are really Peach Cobbler Scones. Details, details… the DETAIL that is important is how excellent these scones are, no matter what they are called. 🙂 To say that I loved these scones is an absolute understatement. I LOVED these scones. Sorry for shouting, it’s true though. I made these scones at the tail end of summer last year, with the last of the impossibly delicious and super fresh Georgia peaches that come into Nashville by the truckload. I don’t think I’ve had a bad peach since moving south. But a bad apple? By the dozen, unfortunately. But this isn’t apple season… it’s peach season! So let’s celebrate with these scones. 🙂 I waited patiently to share them with you, but now I’ll have to make another batch with the first peaches of the year. 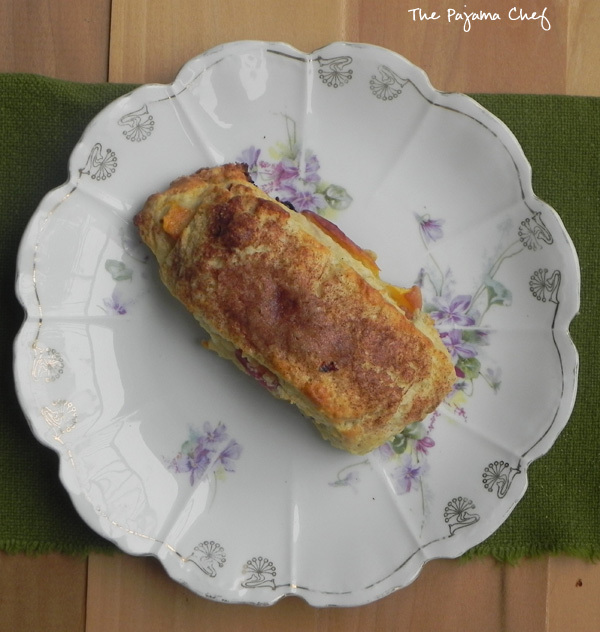 These scones are such a treat, and a wonderful way to enjoy fresh peaches. Normally fruit scones can be difficult to work with because the juices soak into the pastry dough, but this time the fruit is layered between the dough, cobbler style. Hence the name, ha. The dough bakes up around the peaches, creating a delicious pillowy effect. 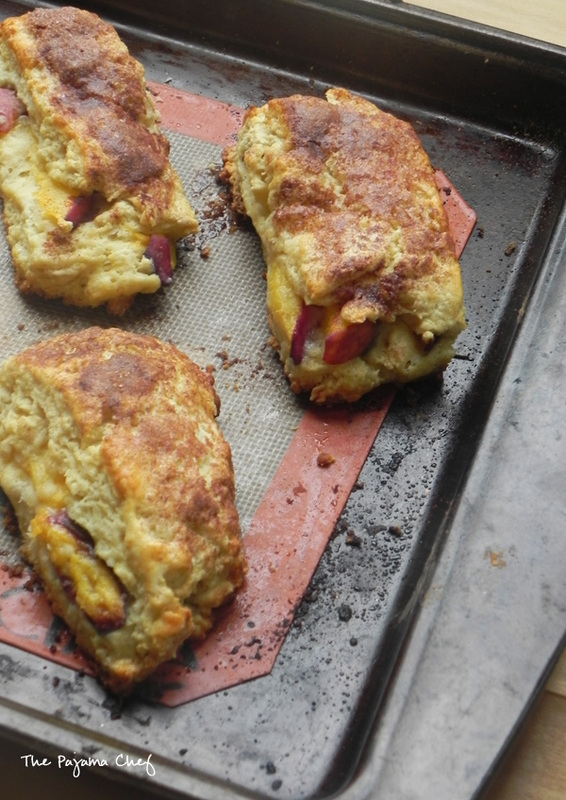 A dusting of cinnamon sugar completes these tasty treats. When you make them, be sure to use good peaches. There’s not much added sugar so the sweetness is totally fruit-driven. Enjoy! Preheat oven to 400 F. Line a baking sheet with parchment paper or a silpat. Whisk the flour, sugar, baking powder, and baking soda in a large bowl. Cut in butter with pastry blender or two knives until mixture resembles coarse crumbs [butter pieces shouldn’t be larger than a pea]. In a measuring cup or small bowl, use a fork to beat together thee egg, 3/4 cup buttermilk, and vanilla. Pour into the bowl with the dry ingredients and use a fork to gently mix until dough comes together. Turn dough out onto a floured countertop. Gently knead a few times to bring dough together, then press into a 12×10 inch rectangle. Brush the long half of the dough with buttermilk, then place peach slices in a single layer over the buttermilk-brushed dough. Fold the opposite side of the dough and place on top of peaches to cover completely, then press edges gently to close. Refrigerate scones for at least 20 minutes if they are soft, then combine sugar and cinnamon. Brush top of scones with buttermilk and then sprinkle with cinnamon sugar. Bake for 16-18 minutes, or until golden brown and the edges don’t appear wet/gooey. Cool on a wire rack for 5-10 minutes before serving.